Administrator Help > Coveo Enterprise Search 7.0 > Administration Tool > Index Tab > Sources and Collections Menu > What Is the Difference between a Collection and a Source? Collections and sources are subdivisions of the index. Collections are groups of sources built around a theme (ex. 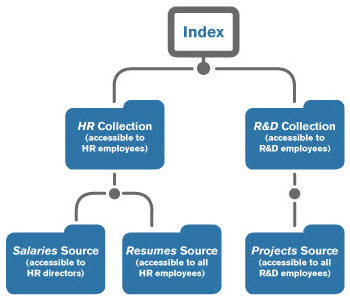 : Human Resources and R&D collections); whereas, sources are groups of documents from a single repository (ex. : all documents from the Coveo website). Each collection and source has its own security permissions, meaning that it is possible to limit their access to subgroups of users. Note: Users cannot query a source unless they have access to its parent collection and cannot query a document unless they have access to its parent source.